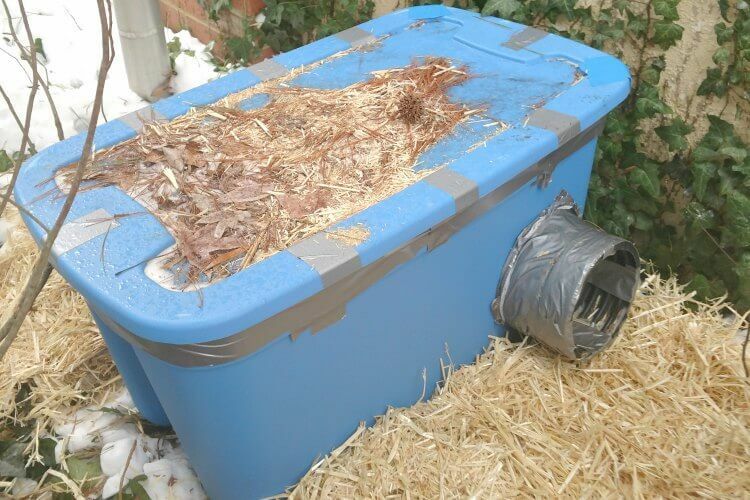 Feral cat shelters are inexpensive and easy to make. 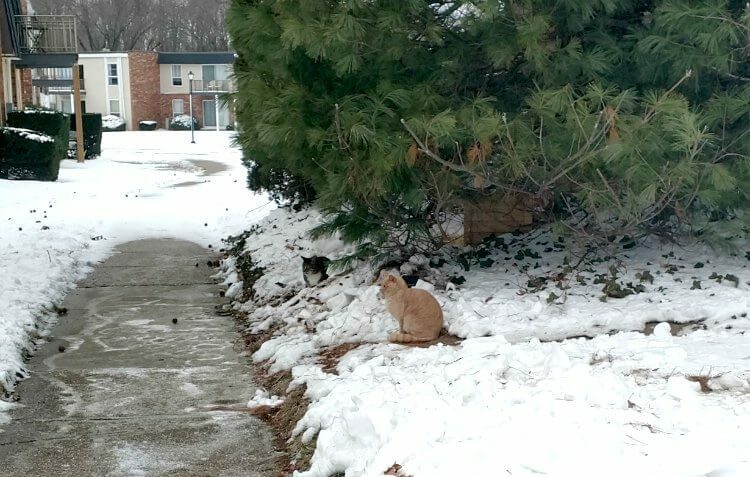 Like many animal lovers who live in regions that have been experiencing record cold temperatures, I was worried about the feral cats in my neighborhood. Luckily, I was able to attend a feral cat shelter-making workshop to enable the kitties in my area to stay warm and safe. The feral kitties who live at my apartment complex are well cared for. I live in a lovely garden apartment complex in South Jersey, in the shadow of Philadelphia, occupied by a colony of feral cats. A group of my animal loving neighbors arranged for the kitties to undergo a trap/neuter/return (TNR) program. This involves partnering with a local animal shelter to trap the feral cats, after which they are spayed or neutered, given the requisite vaccines, and then released back into the outdoors. The ‘Kitty Klubhouse’ offers fine dining for ferals. One of my neighbors loves the kitties so much that she feeds and cares for them and arranged a cat community in an elevated, tree-lined clearing. The centerpiece is what I call a “Kitty Klubhouse,” a cute wooden shelter where the cats can enjoy fine dining away from the elements. While these kitties are very well cared for, I was concerned about how they would survive the harsh winter. So I was thrilled when a cat welfare activist friend from Philadelphia invited me to a feral shelter workshop held in the fall at ACCT Philly, which provides shelter and life-saving services for the city’s homeless, abandoned and abused animals. 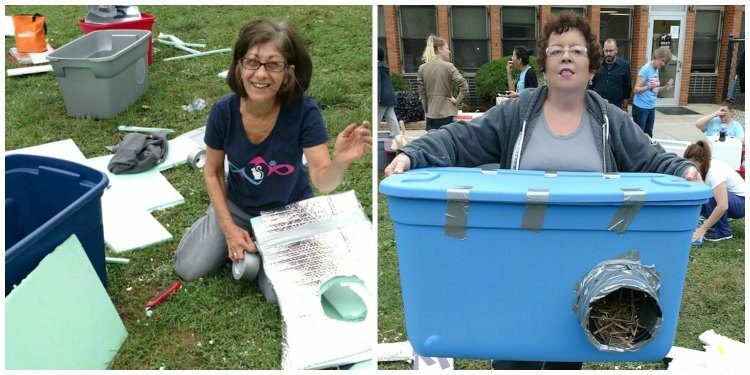 The shelter-making workshop that my friend Mindy and I attended in fall 2017 was free; participants were merely asked to make donations to ACCT Philly. Local businesses had generously donated all of the supplies. Volunteers were on hand with electric saws and other tools, and to give instructions. This was an extremely well run, well-organized event that was also loads of fun, and gave us the gratification of helping a “furry” worthy cause. Mindy Greeberg-Carfagno (left) and the author (right) had a ‘meow-velous’ time at the ACCT Philly feral cat shelter workshop. 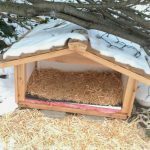 Feral cat shelters are easy and inexpensive to make. In fact, you may already have some of the materials on hand. Measure and cut holes on adjacent opposite long sides of the bin large enough to fit the plastic piping. This will give cats two escape routes to prevent their being trapped by predators. Line the bottoms and sides of the bin with the insulated foam paneling. Measure and cut the panels with a utility knife, with the reflective parts of the panels facing inward. Securely duct tape the corners and bottom where the panels meet, to ensure maximum waterproofing. Using a Sharpie marker, trace the circled holes where the piping will go, and cut with a utility knife. Cut the pipe into two 8-10″ pieces. (The piping provides the shelter with enhanced protection from wind, rain and snow.) Slide in the piping so that edges are flush with the insides of the bin, and secure with lots of duct tape. Fill the bin about ¾ with straw. This will enable the cats to snugly burrow inside the shelter, and provides maximum insulation from the elements. Lastly, cut and place a foam panel on the top, place the bin lid on top and secure the lid with lots of duct tape. You can also place some bricks, rocks or other heavy objects on top of the lid to further prevent the lid from blowing off during high winds. Voila! You now have created a shelter that any feral kitty would be happy to occupy during harsh weather. Epic Pet Health has long supported animal shelters and rescues by donating our all-natural holistic remedies for dogs and cats. If you care for feral or stray kitties, you can administer any number of our products to ensure that they remain healthy and happy. The odorless, tasteless products are super easy to use. All you have to do is apply some spray or drops to a pet’s food and water. Thus, these are ideal for ferals. Epic Pet Health applauds all you animal lovers who help to keep feral kitties happy, healthy and safe!